Introducing what I hope will be monthly interviews with fun, interesting, and crafty folks. First up HAD to be Ms. Julie Ebersole. Julie blogs at Paper Trufflez. 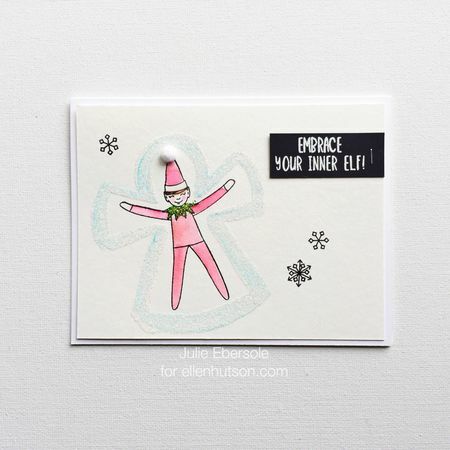 She also designs stamps and dies for Ellen Hutson and is the talent behind the Hello Monday videos on the Ellen Hutson Classroom blog. I’ve admired Julie for years…. Enjoy! 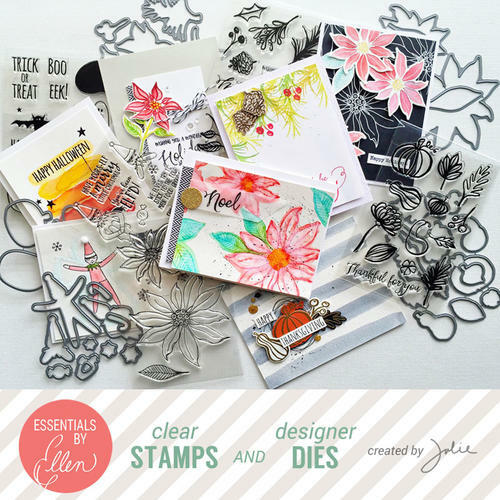 Q. Julie, there is a whimsical, fresh, freehand, style to not only your designs, but to many of the stamp designs from the Pacific Northwest (for example, Savvy Stamps). I just saw the Japanese animated film, The Tale of the Princess Kaguya. During the movie, which is full of stunning drawings, it occurred to me that perhaps this Asian, hand drawn style, has influenced you and other designers in the Pacific Northwest. Any thoughts? A. Thank you! Oh, gosh--I’ve been a fan of Savvy Stamps for, like, EVER!!! I still own stamps they created nearly 20 years ago—I love them so much, I just can’t part with them! I think it’s true that here in the Pacific NW there is a great love of hand-drawn art styles—I adore the subtle yet charming imperfections inherent in that type of style… I also like things that are a little quirky, and make me laugh! Q. Can you please describe the process of designing a stamp set? For example, how do you select what images to include in a set -- why the delightful elf in Elf’d as opposed to a whimsical reindeer? A. Hah! Hmmmm, well, Elf’d came about because I get such a kick out of the Elf on the Shelf and Ellen was the one who actually suggested I try creating a stamp set—it was really hard to do, because, as you know, the Elf himself can be found doing about a million different activities and I had to narrow it down to fit within the confines of a 4x6” space! Most often, I create a set because it’s a matter of “I wish I had something like this…” Case in point: Mondo Magnolia and Mondo Poinsettia came about because I wished I had a single ginormous floral image that would fill up a card in one fell swoop! Q. All of your designs look hand drawn. What program do you use to draw your designs and how many versions do you go through? A. I probably have one of the most mediocre processes out there, LOL! Some of my designs are actually hand-painted, scanned at a super high resolution, and then the art work is “cleaned up” via Photoshop. Other times, I may start the design out completely on my iPad mini, using a vector drawing app and then export it into Illustrator for further finessing and tweaking. I go through a lot of versions whether it’s hand-painted or rendered by vector—it takes me a looooong time to finalize my drawings/artwork because I’m super picky about how I want it to look in the end, and because I’m completely self-taught with Illustrator and Photoshop, so I’m still learning how to manipulate the computer software to make my images look how I like/envisioned in my head. How long does it take from “I wonder what I’ll design” to releasing the design to the public? It can be anywhere from 2-4 months, depending on whatever else I’m juggling, anticipated launch date, and manufacturing turn-around times. Q. How do you stay fresh and trendy without repeating what everyone else is designing? For example, there are tons of fantastic pine branches, pine cones (which, by the way, are really hard to draw! LOL! ), poinsettias, pumpkins, acorns, ghosts, etc., already out there. So, I just sit down and start painting… and painting.. and painting some more… until I’m happy with it—a LOT of paper ends up in the trash. In the end, I try to develop something that reflects my own personal loves. Q. Speaking of trends -- How do you stay on top of what is trendy? Trends appear random to me – it seems like all of a sudden pineapples are everywhere and then, they are yesterday. How do you fit trends into your work? What trends delight you right now and what trends just don’t appeal to you? A. This question cracks me up because I’m always the LAST person to know what is trendy—and I would agree they appear random to me, too!!! I love birds, for example, and I never get tired of putting them on things. *grin* Are they trendy any more? I have no idea. I just like them and will forever. I love pineapples, and “gemstones”, etc. but I don’t often go “whole hog” with any trend and usually just tuck them in here and there when it suits a project. I am, however, obsessed with brush and watercolor style lettering/modern calligraphy, gold, woodgrain, ombré, polka dots, stripes and geometric shapes… and I firmly believe one can never have too much washi tape! Q. Your Hello Monday videos are fabulous! It all appears seamless. How long does it take to plan a card, make, and edit a video? Are there a lot of re takes? Loved reading a bit about Julie's design thoughts and hope you did as well! Thanks, Julie, for taking the time to let us get to know you a bit better! I've got interviews in the works for October and November. Stay tuned! Love this! Can never get enough of Julie. She's definitely the Queen of CAS Design and such a kind, fun person, too! I LOve Julie - I'd recognize that giggle anywhere - admire her style, and fearless card designs... um have you seen the latest congrats card? Fab. U. Lous!!! Thanks J.B.! thanks for the interview with Julie - enjoy her videos and her line of stamps - so fun to know more about her. Awesome interview! I've been a silent stalker of Julie for 10 years. It's a treat to read of her process. Thanks Joan and Julie! Great interview - I love both the thoughtfulness of the questions and the thoroughness of the answers! Thanks Joan and Julie! Love this new feature and love your first guest! Loved the interview. Glad to hear you are going to make this a monthly post. Can't wait to see who is next. Enjoyed the video - I love knowing the way people think, and what inspires them! Great interview - thanks, Joan! Super feature Joan! One to look forward to each month. 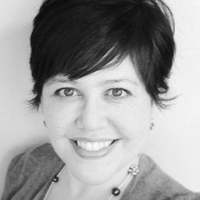 Julie is a bright light in the craft world, thanks for sharing her interview. That was a great interview...nothing ho-hum about it. You really asked interesting questions Joan. I found Julie on Splitcoaststampers and never have I been without her inspiration. I'm really looking forward to future interviews. THANK YOU Joan. Love this series and learning more about the fabulous and Julie Ebersole!! I really loved hearing about her design process from her stamps/dies to her Hello Monday series. So inspirational!! Great job on the interview! And she makes a darn good Appletini! Or maybe that was a trend. They were here, now they're gone? Great interview, Joan! Good questions to which I was actually curious about the answers. Fantastic interview Joan! Loved getting to know a bit more about Julie's design process and her ideas on whats 'trendy'. She is such a scream!! "CLAPPING" LOVE this interview! I ADORE Julie and taking her classes. She is a dream and I feel so lucky to live in the PNW around and amongst so many talented artists! I love, love, love Julie. You asked great questions, allowing us to get to know her better. Thank you! Thanks for taking the time to leave a comment. I read each one and often have difficulty responding. If you want to hear back, please leave your email address.